Exploding Doughnut: Watching artwork being made. While waiting at the Van Buren train station earlier in the week, I was drawn to the mesh that lined the bridge directly overhead. Its bright orange popped against the solid blue backdrop. 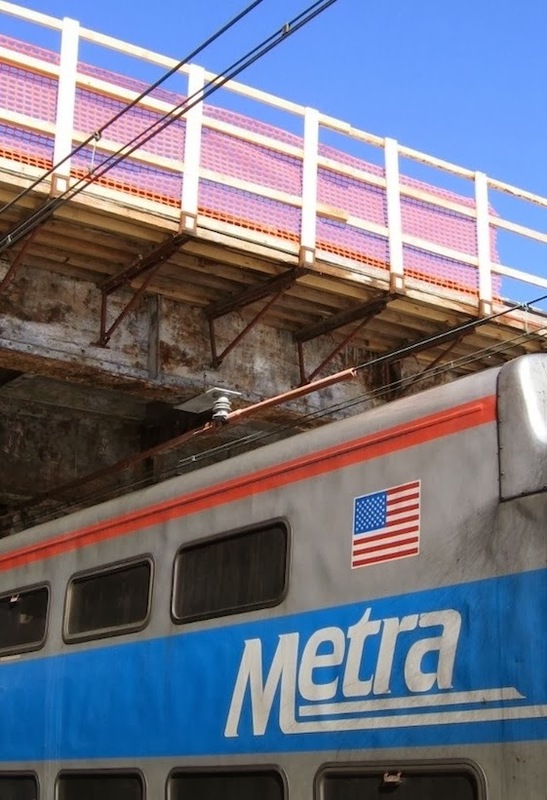 And then I noticed those two colors repeated on the Metra train just below it. It's been a relentless winter and it was wonderful getting a break from it this particular day. Melting snow rained down from rusted beams, sunlight warmed everything in its sight, all under a sky so cerulean it could touch your soul. Creativity and possibility seemed to be stirring among all those unrelated elements...almost like watching artwork being made. Seeing beauty in the details…that is art! The Van Buren Station is so old and in much need of repair, but every time I go in it, I can still see it has beauty. I was just there this morning and this post gave me a new love for it. Thanks Dean! You're so observant. I suppose it serves you well as an artist to notice the colors and forms which just "go in one eye and out the other" for many of us. I checked out the links. Van Buren looks like a pleasant enough station, and the Paris Metro style entrance is a really nice touch. Overall, that's quite the commuter rail system. "The Van Buren Station is so old and in much need of repair..."
You got that right. Every time it rains outside it drips down from the ceilings to the underground tunnels. So sad. The Paris Metro style entrance is outside on the Grant Park side and is the only part of the Van Buren train station that's pretty to look at. The underground part of the station is a total dump! The ceiling drips, a lot, when it rains, tiles are missing from the walls and floor, the old wooden benches are carved with years of tagging, and overall it just looks dark and dingy...and scary. As Rick said in the comment above, it's in need of repair. Bad!